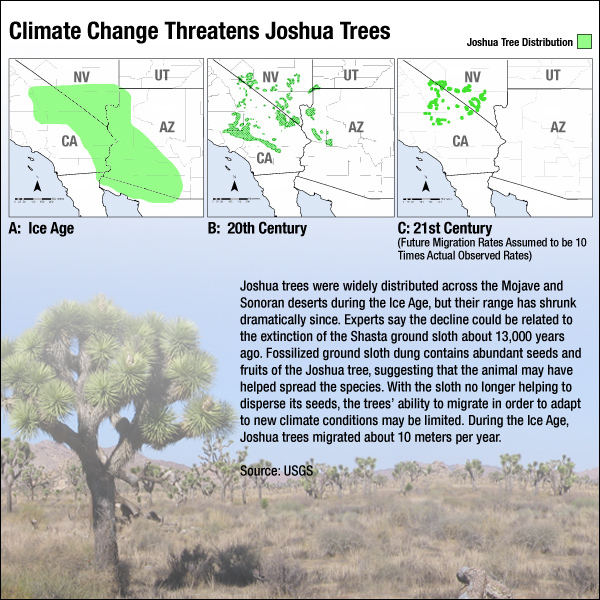 Outlook Bleak for Joshua Trees During the Ice Age, Joshua trees thrived across the American Southwest with the help of the ground sloth. The animals have been extinct for 13,000 years, and scientists predict that without the sloth's help, global warming will cause the desert tree to disappear, too. 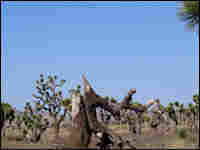 Joshua trees can grow 30 feet or taller. This is an especially large one, with plenty of branches covered with green leaves with spiny tips. A lot of once-magnificent trees like this one have died. Very few new ones have taken their place. 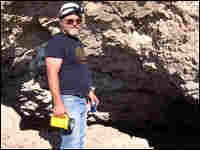 Ken Cole, a USGS geologist, heads into Gypsum Cave to explain the story of why Joshua trees will take a pummeling under climate change. 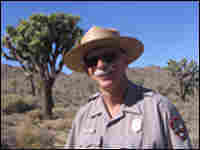 Joshua Tree Park Ranger Joe Zarki says park officials are worried about the fate of the Joshua tree, especially because climate change is not the kind of problem they can fix inside the park. 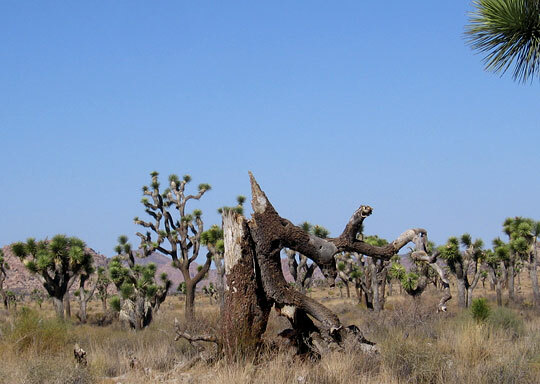 During the Ice Age, Joshua trees thrived across the American Southwest. Now some scientists are predicting that global warming will cause the unusual desert tree to disappear, too — at least in its namesake national park. Scientists predict that climate change will evict many plants and animals from areas where they have long flourished. Some will be able to migrate to more hospitable climates, but many — like the Joshua tree — face huge obstacles to moving and adapting. 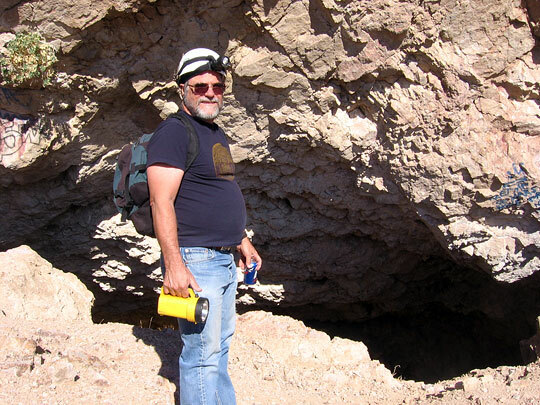 To grasp the current plight of the Joshua tree, it's helpful to travel to Gypsum Cave outside Las Vegas. In the 1930s, scientists exploring there found parts of skeletons, hides and hair from the giant ground sloth — an animal that had been extinct for 13,000 years. Many layers of the sloth's dung also survived. Inside the dung was evidence that Joshua trees were a favorite food of the sloth: leaves and seeds and fruits. The sloths were hulking beasts that resembled "a fuzzy Volkswagen Beetle" according to Ken Cole, a biologist and geologist for the U.S. Geological Survey. After munching on Joshua trees, a sloth might travel 10 miles or more before leaving a deposit of the seeds in dung. The result was a sort of starter kit for Joshua trees: seeds with their own supply of fertilizer. At Gypsum Cave, a small deposit of the ancient dung remains, looking a lot like shredded wheat. Remarkably, after 13,000 years, it still produces an odor. "I think of it as like a grass — maybe not a hay smell, but similar to that," says Sandy Swift, a colleague of Cole's. The ground sloth didn't survive the big warm-up after the Ice Age, so it could no longer play Johnny Appleseed for Joshua trees. And since then, the trees' range has shrunk to one-tenth of what it was. Cole says no modern animal is capable of helping the Joshua tree migrate long distances. So Cole predicts global warming will shrink the tree's range still more. "It looks from our modeling that Joshua Tree National Park and pretty much the southern half of the range would be too warm in the next 50 to 100 years to support Joshua trees anymore," Cole says. That news caught the attention of top officials in the National Park Service and rangers in the park in southeastern California. "One of the questions I guess we talk about, at least internally, on an informal basis, is 'What do we have here without Joshua trees?'" says Joe Zarki, a longtime ranger. 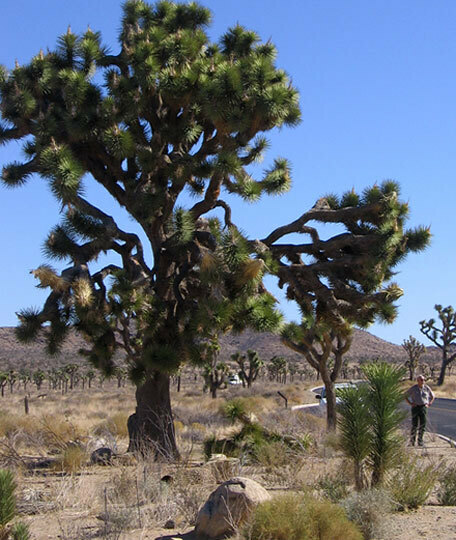 Joshua trees are a type of yucca that grow 30 feet or taller. The ends of their short branches are covered with clusters of green leaves with spiny tips. An early explorer named John Freemont called it the "most repulsive plant in the vegetable kingdom," Zarki says. "People nowadays, I think, look at it and see this really distinctive, sort of whimsical plant," Zarki says. "I like them. It's a plant with character." 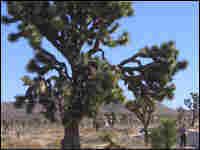 Jim Cornett, an independent ecologist who has been studying Joshua trees for almost 20 years, doesn't buy Ken Cole's grim prediction about the trees disappearing from the park. "There's no question that a warming of the climate would reduce the suitable habitat for Joshua trees in the park — but not eliminate it," Cornett says. Cornett believes the trees would still grow in the higher, cooler elevations of the park. Still, hiking across the desert on a gorgeous day, Cornett says Joshua trees have done poorly since he started tracking them. As an example, he stops at a large, dead Joshua tree lying on the sandy ground. "It was a magnificent tree when we started the study, and now it's dead," Cornett says. "And this one is dead. And that one over there is dead. I can find a dozen trees that have died during the study and only one tree that came up." The trees in some hotter sections of the park have fared even worse. But Cornett says he can attribute their deaths to severe droughts and fires in recent years. He concedes that climate change may be playing a role. 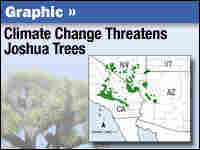 One thing's for certain: if Joshua trees go, the whole ecosystem will suffer. During the driest times, the only way many animals can find moisture is by gnawing through the bark of live trees. "Things like the antelope ground squirrel, the desert wood rat and the blacktail jack rabbit are now all known to utilize that moisture during times of extreme drought. And of course, if those animals survive, then the coyotes, the foxes and the hawks continue to have animals to prey on and then they survive, as well. So the Joshua tree is the great canteen of the desert," he says. The trees are a great draw for tourists. Loretta and Jim Gilbert, from Seal Beach, Calif., were visiting the park to celebrate Jim's retirement. They said they couldn't imagine the park without its signature trees. "It would not be Joshua Tree any longer. It would just be space," Loretta Gilbert says. 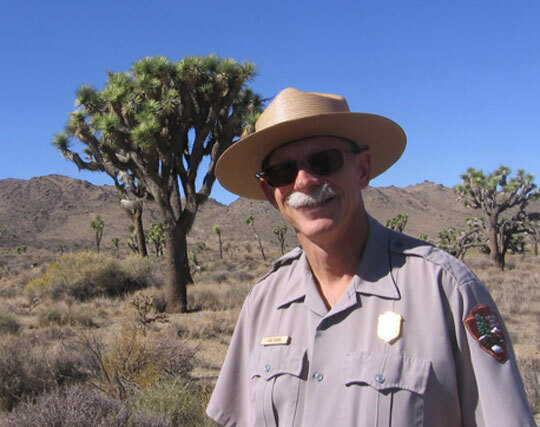 "The Joshua trees are very special, something I would hope the future generations would be able to see and enjoy." Park officials fear that saving the trees is beyond their control, because stopping or slowing global warming will take a worldwide effort.